The eclectic group of musicians discuss classical influences, 10-string guitars, and the new album. Coma Cluster Void are an eclectic math metal collective with members from USA, Canada, and Germany featuring Mike Disalvo (Ex- Cryptopsy), 10-string guitar, and mind-breaking drumming. 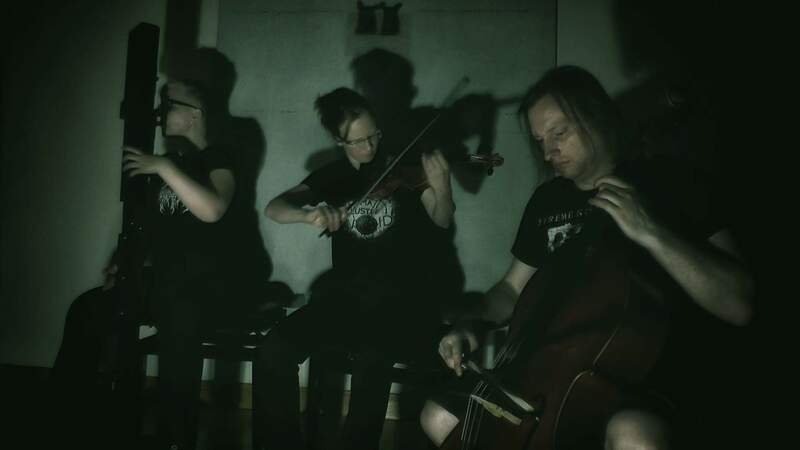 Their new album, Mind Cemetaries, is a whirlwind of technical musicianship and is bound to end up on many end of year lists. We got a chance to pick the brains of several members to learn more about the album, the influences, and what’s in store for this exciting group. TO (FlightOfIcarus): First off, could you give a little background on how you all came together to form this project? John Strieder: Coma Cluster Void was founded in 2013 by me and Sylvia Hinz and based on the idea to bring our musical ideas into a metal outfit and to find people who join us and are willing to create this music with us and without any compromise. TO (Shrivatsan): When the band was being formed, did you have specific people in mind for the vocals and drums? Or did it happen along the way? John: It wasn’t easy to find a drummer who has the stylistic variety and the grip on complex rhythms to fit in with our music. After some search and “auditioning” online, we got from Anthony Lipari, mastermind of Thoren, the tip to check out Chris Burrows. We watched his youtube channel and took him right away. Since we were always a fan of Mike DiSalvo on albums like ‘… and then you’ll beg’, we were at first searching for a vocalist with a similar style. Eventually Sylvia was able to find and contact Mike himself, who was intrigued by our demos and other works and was in. Due the auditioning of other vocalists the idea shaped to have dueling vocalists, and being impressed with Austin Taylor’s work at Dimensionless, we asked him and he was in, too! Having two vocalists gives the opportunity for dense vocal arrangements in a natural way without any overdubs/overlaps or other effects. In general, we strive for rawness without effects. TO (S): Founding members Sylvia Hinz and John Strieder both have backgrounds in classical music. Where did the inspiration to pursue death metal come from? TO (S): Coma Cluster Void has a multi-national lineup. While it is hard to compose regular death metal when the members are separated, I imagine it to be ten times more complicated with the type of technical playing in Coma Cluster Void. How does a song typically get composed? How are the ideas of different musicians incorporated into the tracks? John: I think we have a very smooth workflow. We are all uncomplicated people and have a great chemistry together. We use E-Mail and facebook messages and there are not many words needed to get things done. It starts with me writing a complete song and creating a demo of it, I draft down the guitars and program drums. This demo I send out to the other band members, each of them creating their own parts based upon this. TO (F): Do you find your various locales playing into the music in any special way? TO (S): What are some of the lyrical themes explored on ‘Mind Cemeteries’? Do the lyrics come first or are they fitted to the music after composition? John: Usually there’s first the instrumental piece, and Mike gets inspired by it for writing lyrics and vocal arrangements for him and Austin. He has a great sense for cool and twisted “catchy” vocal patterns. The Hollow Gaze and partially Everything Is Meant To Kill Us were an exception since the lyrics were first. I give the songs working titles, which are often dismissed later for “real” titles But sometimes a working title stays and becomes the lyrical basis, like in the case of Petrified Tears, the emotional climax of the whole album. Austin did a great job on those lyrics and his vocal arrangements are insane. All lyrics are set in the world and circle around the being we can see on the album cover artwork. TO (S): The music seems to have a lot of influences from classical dissonant music. For metal fans looking to explore some of the classical inspirations behind Coma Cluster Void, what are the starting points you’d suggest? TO (F): What about metal influences? What bands were you listening to the most when you wrote this album? Who are your band’s biggest inspirations? John: I actually listened to a lot of old school death metal, haha! I grew up with bands like Pantera, Crowbar, Morbid Angel and Cannibal Corpse. I think I listened hundreds of times to ‘The Bleeding’! I remember having some songs of ‘Altars as Madness’ on a cassette tape and listened to it over and over again or how I recorded encrypted MTV Headbanger’s Ball Show to tape. What times! Mike DiSalvo: I have an eclectic taste in music but I agree with John, I have been listening to a ton of old school death metal like Dismember‘s ‘Like An Ever Flowing Stream’ and Bolt Thrower‘s ‘Realms of Chaos’ but I have also been spinning the last couple releases by Opeth and Katatoniabigtime. Others that have been hot on my list are Gorguts – ‘Pleiades’ Dust’, Steven Wilson – ‘Hand. Cannot. Erase.’ and the new Abbath record. I could go on and on but these albums have been on heavy rotation for a while now. Chris Burrows: I love drummers who push the envelope in how much versatility they can bring to the table, while also saying something equally innovative and musical. Drummers such as Martin Lopez, Jason Rullo, Chris Adler, Virgil Donati, Gavin Harrison and Dan “Loord” Foord were hugely influential. TO (F): It pretty much goes without saying that your songs are extremely difficult to play. Which would you consider the hardest? Why the technical focus to begin with? John: It’s hard to tell which song is the most difficult to play … each song has different technical difficulties. Ah, Chris just said, Petrified Tears and Everything is Meant To Kill Us were the most challenging drumwise? that might be true for the other instruments as well! Though, writing music that is difficult or complicated is not our goal, I just write what I have in mind, and it automatically sounds like this. I would call it a search for a kind of “richness” in sound. I like music that has a certain amount of detail and richness that keeps your mind occupied. TO (F): On a similar note, why a 10-string guitar? How did you come to start playing it? John: The moment I had a guitar in my hands I started experimenting with different tunings, which was decades ago. If you write tonal music, the standard tuning is a convinient tuning. But if you write atonal music, it isn’t convenient anymore. My composition 4 erloschene Bilder(performance by Carlos Bojarski) uses standard tuning, but it was not easy to write my music without compromise in this tuning. Since atonality is a natural expression for me, I created a tuning which turns the instrument back again into something convinient. The amount of strings is a compromise between the desired range and the desired harmonical principles (based strictly on my musical taste ) of the tuning. TO(F): Any big plans for touring? Bands you would love to play with in the future? TO (F): Name for us an underground metal band that few people know about and why people should be paying them more attention. TO (F): Anything else you would like to share about the band or the album? FlightofIcarus is a father, licensed counselor, and full time metalhead. When he is not working and spending time with family, he is writing furiously to promote underground bands on his own site, Metal Trenches. He believes staunchly in writing only constructive reviews, and his favorite bands include Dark Tranquillity, Enslaved, Poison the Well, and Deftones. You can also buy his ebook, The ABC’s of Black Metal.